Several years ago I returned from studying abroad in Spain. I had a life-changingly amazing and powerful experience in Spain and when I returned I dealt with terrible fits of reverse-culture-shock and nostalgia. While in Spain, I wasn't fortunate enough to have a very broad or successful introduction to the gastronomy of the region, but when I returned I was desperate to recreate one of the dishes that reminded me most of Spain: Tortilla Española. I searched online and in cookbooks for recipes, but none yielded the basic instructions I needed to get the mechanics of a proper Spanish Tortilla correct. You see, I never actually got to witness anyone making a Tortilla while I was in Spain, so my understanding of the process was severely lacking. Over the course of a year, I tried a dozen times to make a Tortilla, tragically succumbing to inedible inexactitudes. Inebriated by my nostalgic pangs, I didn't give up. Each of the various attempts I learned something new, but it wasn't until a blessed evening with a colleague who had also been to Spain and knew the correct process that I finally had a breakthrough. Over the ensuing months I refined my technique until I became satisfied that I could indeed make a proper Tortilla. I never really had measurements for things. I'll try to provide estimates, but the approach I took was more algorithmic, responding to queues as I went. I used a 10" cast iron skillet to make this. I adjusted the measurements to fit the implement. Dice the onions. The onions aren't essential. However, they do add an additional aroma to the Tortilla and a different flavor profile when biting into them directly. 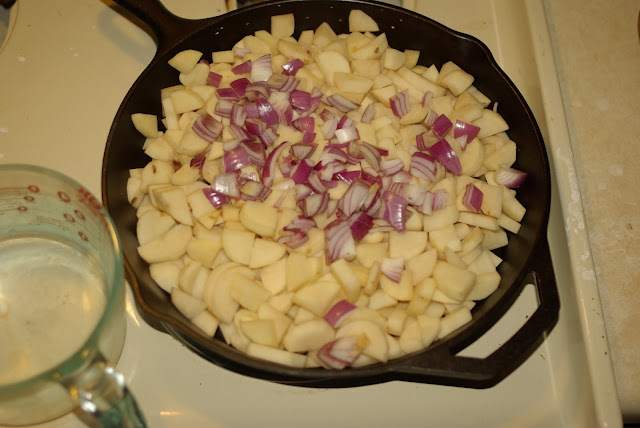 Place the potatoes and onions in the skillet and add quite a bit of olive oil. You're looking to cover the bottom of the skillet in oil about a 1/2" or more deep. It's the sweet-spot between deep frying and pan frying that you're looking for. Obviously, you may want to use your cheapest olive oil, or use a cheap non-olive oil (it shouldn't make too much difference). Turn the skillet on medium-high - high. You're looking to cook the potatoes until they just become soft enough to easily put a fork through. They won't cook much in the rest of the process, so make sure they're done enough to be palatable to eat. Cook them too much and they will tend to break up and sort of disintegrate into the egg, which will create problems getting the Tortilla cooked through and won't taste as good. 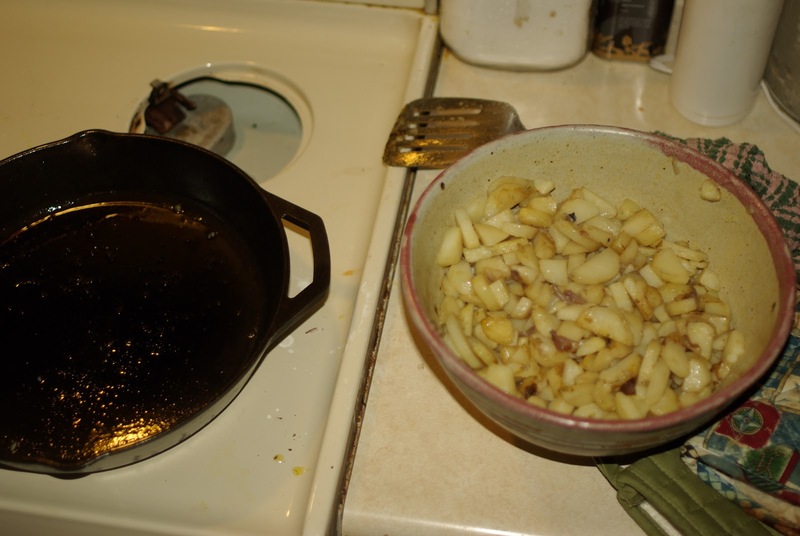 While you're cooking the potatoes, you want the temperature to be hot enough to cook them, but not hot enough to turn the potatoes crispy or to smoke the oil. You want to mix them frequently while cooking because you are not looking for any browning to occur (a little is okay). While cooking them, add a bit of salt, enough to season the potatoes a bit (This helps the flavor profile of the end product. Without any seasoning, the potatoes can be too bland of a contrast and provide a distraction from the overall flavor). A few moments before they're at perfect cookedness, grab some sort of lid that will allow you to drain out all the oil (or a strainer of some sort) and a bowl-ish type receptacle to catch the drained oil (could drain into sink if not saving oil). Drain off all the oil. Pour the potatoes into a large bowl. Put the skillet back on the stove (no-heat). The potatoes will continue to cook until you get to the next step, so this is why I mention doing this a few moments before they're perfect. Depending on how quickly you transfer them to a bowl and add the eggs, the potatoes could end up overcooked if you're not careful. With your potatoes in a large bowl, start cracking your farm-fresh eggs over the potatoes. The number of eggs is quite variable, depending on how many potatoes and the size of the eggs. With the 10" skillet, I recall using 10 - 12 eggs (usually 12). The eggs will and should start cooking an itty-bit when they hit the potatoes. This is good, but add them relatively quickly so they don't cook too much. The combined egg-potato mixture should be liquidy enough for the eggs to fully engulf the potatoes, but not too liquidy so that if you squished the potatoes down (don't do this!) there would be much eggy liquid on top. If you add too few eggs the mixture will be "dry" and the resulting Tortilla will struggle to bind and form a proper Tortilla. If you add too many, the mixture will be too "wet" and the resulting Tortilla will be too eggy (edging more toward a quiche than a proper Tortilla). Mix the egg into the potatoes gently (you want the potatoes to keep their shape and integrity). Add salt. How much? This is the trickiest part. Since this is a raw egg mixture, it's not easy to just taste it to test it's saltiness. I largely just went on gut based on trial and error of making it many times. Too much salt and it's unpalatable. Too little and it doesn't have enough flavor. In the beginning, I suggest adding a bit more than you think is about right. The size of the mixture and the amount of salt it takes to season the dense Tortilla can be deceptive. I recommend erring on the "too much" side to begin with. It's really all-or-nothing, once you start cooking it you can't really add more salt if you don't have enough. Turn the burner back on the skillet to low - medium. It's okay if the mixture sits for a couple minutes during this process, just avoid it sitting long enough to congeal (or long enough for the potatoes to being to disintegrate into the egg). Pour the mixture into the skillet (you shouldn't need to add any oil as it should still be coated well from cooking the potatoes). Experiment with the temperature. You have to take care not to burn it as is cooks through. This part is a bit like cooking a pancake. You have to cook it until you start to see bubbles forming on top and the egg starts to cook a bit up into the Tortilla, but not at too hot a temperature that you burn the bottom. It can be helpful at this point to put a lid over it to reflect the heat back onto the top part of the Tortilla to help cook and firm it up before flipping. With these measurements, your Tortilla should be 2-3" thick. Gently lift the edges (if you can without breaking it) to check the bottom. Aim for a golden brown finish. Now comes one of the trickiest parts. You have to get the damned thing flipped without destroying it! The process I found to work is to get 2 large plates big enough to cover the skillet. Put one plate on top of the skillet and using hot pads, flip the Tortilla onto the plate so that the uncooked Tortilla side is face-down on the plate. Remove the skillet. Place the second plate on top of the cooked Tortilla side. Flip it again. Remove the top plate so that the uncooked Tortilla side is facing up. Place the skillet on top of the uncooked Tortilla side, and using hot pads, flip it one last time so that the uncooked Tortilla is face-down in the skillet. Through this whole process take great care not to burn yourself as the pan will be quite hot (especially if you're using cast-iron) and the Tortilla plus pan plus plates can get quite heavy. Return the skillet to the burner and cook for a bit longer until the uncooked side is a golden brown color. This shouldn't take very long, and not nearly as long as you cooked the first side of the Tortilla. Remove the Tortilla, place on a serving plate, and when cool enough, cut into pie slices and serve. Done "properly", the profile of the slice should reveal a highly marbled pattern with very little egg space between the pieces of potato. In Spain it isn't uncommon for the Tortilla to contain other ingredients (ie. tuna or other meat added to the middle). However, in my experience eating these types of Tortillas, and the one or two times I tried to make them, I feel it pretty much ruins the Tortilla. It's a gloriously simple dish, and in my opinion, ought to remain that way.